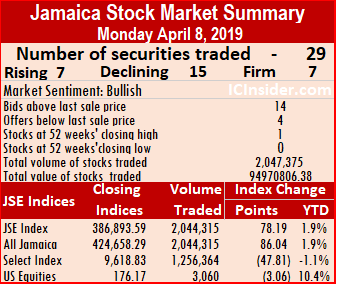 Trading on the main market of the Jamaica Stock Exchange ended Monday as the JSE All Jamaican Composite Index sank 1,698.05 points to 417,110.99 and the JSE Index dropping 1,543.07 points to close at 380,035.17, with a positive advance decline ratio. At the close of the main and US markets, 28 securities traded, compared to 30 on Friday leading to 12 advancing, 7 declining and 9 closing unchanged. Trading ended with just 1,439,179 units valued at just $37,607,638 compared to 2,536,555 units valued $102,402,822 crossing the exchange on Friday. Wisynco Group led with 603,633 shares, accounting for 42 percent of total main market volume, followed by Sagicor Group with 254,940 units with 18 percent of the day’s trades and Carreras with a mere 152,725 units for 11 percent of volume traded. Market activity ended with an average of 55,353 units at $1,446,448 for each security traded, in contrast to 84,552 units at $3,413,427 on Friday. The average volume and value for the month to date amounts to 153,425 shares at $2,384,798 for each security, compared to 161,222 shares at $2,467,500 previously. Trading for March resulted in an average of 438,501 shares at $9,851,307, for each security traded. IC bid-offer Indicator|The Investor’s Choice bid-offer indicator ended with the reading showing 8 stocks ending with bids higher than their last selling prices and 4 closing with lower offers. In main market activity, Caribbean Cement gained $2.98 to finish at $66.50, with 10,819 shares changing hands, Grace Kennedy traded 3,189 stock units and added 45 cents to close at $60, Jamaica Broilers climbed $1.20 to close at $31.20, with an exchange of 35,925 shares. 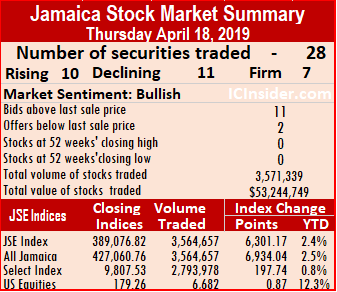 Jamaica Stock Exchange fell 42 cents to close at $16.58, after trading 47,785 shares, Mayberry Jamaican Equities lost 50 cents trading 5,946 shares at $8.6, Pulse Investments rose 35 cents and finished at $2.95, with 25,000 shares crossing the exchange, Sagicor Group rose 85 cents in trading 254,940 shares to close at $39. Sagicor Real Estate Fund exchanged just 500 shares to close at $10.30, after gaining 80 cents, Supreme Ventures rose $1 and finished at $26, with 46,131 units changing hands and Wisynco Group fell 24 cents trading 603,633 units to close at $11.06. Trading in the US dollar market ended with 58,704 units valued at $7,867. Proven Investments gained 1 cents and ended trading with 15,204 units at 23 US cents and Sygnus Credit Investments shed 1 cent in trading 43,500 units to close at 11 US cents. The JSE USD Equities Index rose 2.85 points to close at 179.28. 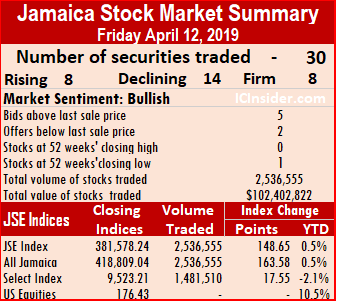 Trading on the main market of the Jamaica Stock Exchange ended Friday with JSE All Jamaican Composite Index added just 163.58 points to end at 418,809.04 and the JSE Index advanced 148.65 points to 381,578.24, with a decline advance ratio of 7 to 4. At the close of the main and US markets, 30 securities traded, compared to 32 on Thursday leading to just 8 advancing, 14 declining and 8 closing unchanged. Trading ended with just 2,536,555 units valued $102,402,822 compared to just 1,499,809 units valued a mere $37,984,293 crossing the exchange on Thursday. JMMB Group 7.25% preference share led with 632,975 shares, accounting for 25 percent of total main market volume, followed by NCB Financial Group with 406,921 units with 16 percent of the day’s trades and Sagicor Real Estate X Fund with a mere 173,989 units or 7 percent of volume traded. 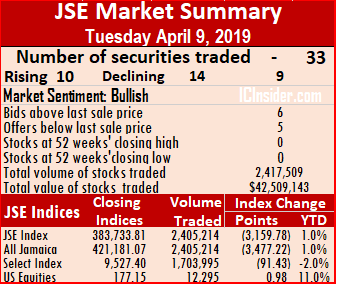 Market activity ended with an average of 84,552 units at $3,413,427 for each security traded, in contrast to 49,994 shares valued at $1,266,143 on Thursday. The average volume and value for the month to date amounts to 161,222 shares at $2,467,500 for each security, compared to 168,967 shares at $2,360,413 previously. 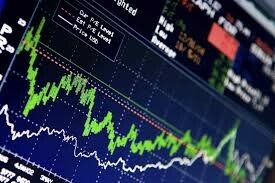 Trading for March resulted in an average of 438,501 shares at $9,851,307, for each security traded. IC bid-offer Indicator|The Investor’s Choice bid-offer indicator ended with the reading showing 5 stocks ending with bids higher than their last selling prices and 2 closing with lower offers. In main market activity, Barita Investments dived $3.50 to close at $39.50, with a 103,722 shares changing hands, Berger Paints lost 73 cents, ending at $20.20, with 50,058 stock units trading, Caribbean Cement fell 48 cents to finish at $63.52, with 37,457 shares changing hands, Grace Kennedy traded 18,650 stock units and lost 35 cents to close at $59.55. Jamaica Broilers dropped $1.20 to close at $30, with 57,256 shares changing hands, Jamaica Producers climbed $1.85 to close at $23.40, trading 12,239 shares, Mayberry Investments lost 50 cents trading 7,607 shares at $8.50, NCB Financial took back the 99 cents it lost on Thursday to settle at $145, trading 406,921 units. PanJam Investments lost 70 cents and finished at $81, with 97,266 shares crossing the exchange, Sagicor Group rose $1 in trading 154,414 shares to close at $38.15 after rising to $41 in early trading. 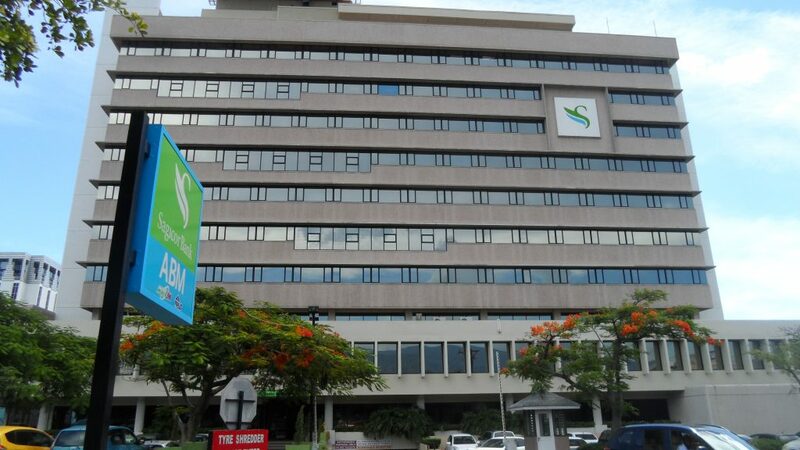 Sagicor Real Estate Fund exchanged 173,989 shares to close at a 52 weeks’ low of $9.50, after falling 41 cents, Supreme Ventures lost $1 and finished at $25, with 42,324 units changing hands and Sygnus Credit Investments gained 98 cents trading 130,717 units to close at $11.98. There was no trading in the US dollar market. 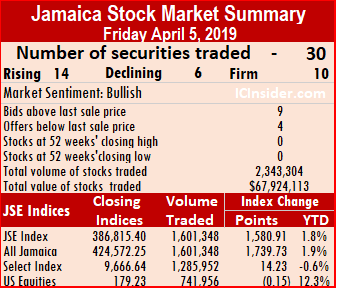 Trading on the main market of the Jamaica Stock Exchange ended Thursday with JSE All Jamaican Composite Index dropping 4,093.70 points to 418,645.45 and the JSE Index diving by 3,720.07 points to 381,429.58 following a decline advance ratio of 5 to 2. 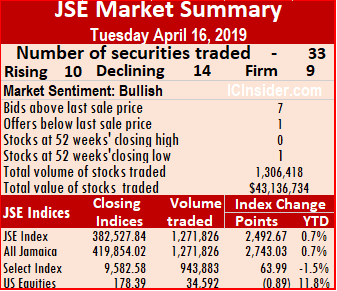 At the close of the main and US markets, 32 securities traded, compared to 33 on Wednesday leading to just 6 advancing, 15 declining and 11 closing unchanged. Trading ended with just 1,499,809 units valued a mere $37,984,293 compared to 1,945,908 units valued just $26,582,198 crossing the exchange on Wednesday. Wisynco Group led with just 286,871 shares, accounting for 19 percent of total main market volume, followed by Barita Investments with just 202,682 units with 13.5 percent of the day’s trades and Victoria Mutual Investments with a mere 138,470 units or 9 percent of volume traded. Market activity ended with an average of 49,994 units valued at an average of $1,266,143, in contrast to 77,588 units valued at $1,371,263 on Wednesday. The average volume and value for the month to date amounts to 168,967 shares at $2,360,413 for each security, compared to 182,335 shares at $2,500,108 previously. Trading for March resulted in an average of 438,501 shares at $9,851,307, for each security traded. IC bid-offer Indicator|The Investor’s Choice bid-offer indicator ended with the reading showing 6 stocks ending with bids higher than their last selling prices and 3 closing with lower offers. In main market activity, Barita Investments dived $7 to close at $43, with a 202,682 shares changing hands, Berger Paints jumped $1.20 and ended at $20.20, with 217 stock units trading, Caribbean Cement fell $2 to finish at $64, with 30,573 changing hands, Carreras lost 35 cents and concluded trading of 71,125 units at $8.90. Eppley ended with a loss of 50 cents trading 4,348 shares to close at $10.50, Jamaica Broilers climbed $1.20 to close at $31.20, with 29,456 shares changing hands, Jamaica Producers lost 45 cents to close at $21.55, trading 116,272 shares. JMMB Group fell 79 cents to end at $30.01, with an exchange of 33,468 shares, NCB Financial gave back the 99 cents it gained on Wednesday to settle at $144.01, trading 21,081 units, Pulse Investments lost 30 cents and finished at $2.70, with 113,778 shares crossing the exchange. Sagicor Group fell $1.85 in trading 109,632 shares at $37.15, Seprod lost 75 cents to close at $42, with 11,431 shares traded and Supreme Ventures lost $1 and finished at $26, with 44,274 units changing hands. Trading in the US dollar market ended with 34,559 units valued at US$4,622. Proven Investments ended trading with 7,500 units at 22 US cents and Sygnus Credit Investments gained 1 cent in trading 27,059 units to close at 11 US cents. The JSE USD Equities Index declined by 3.80 points to close at 176.43. 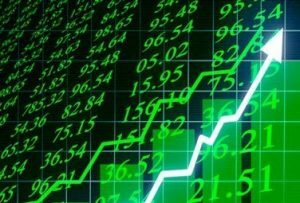 The Jamaica Stock Exchange ended with gains on Wednesday but with limited volume passing through the market. At the close of the main and US markets, 33 securities traded, compared to 29 on Tuesday leading to 10 advancing, 14 declining and 9 closing unchanged. 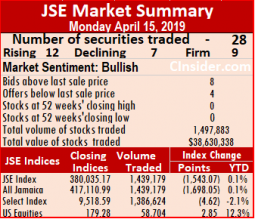 Trading ended with 1,945,908 units valued just $26,582,198 compared to 2,405,214 units valued at $42,509,143 crossing the exchange on Tuesday. Wisynco Group led with 1.2 million units, accounting for 63 percent of total main market volume, followed by Carreras with just 183,814 units with 9.5 percent of the day’s trades and Radio Jamaica with a mere 142,496 units or 7 percent of volume traded. Market activity ended with an average of 77,588 units valued at $1,371,263, in contrast to 75,715 shares valued at $3,510,251 on Tuesday. The average volume and value for the month to date amounts to 182,335 shares at $2,500,108 for each security, compared to 198,040 shares at $2,749,721 previously. Trading for March resulted in an average of 438,501 shares at $9,851,307, for each security traded. IC bid-offer Indicator|The Investor’s Choice bid-offer indicator ended with the reading showing 6 stocks ending with bids higher than their last selling prices and 5 closing with lower offers. In main market activity, Barita Investments climbed $3.50 to close at $50, with a mere 100 shares changing hands, Carreras gained 75 cents and concluded trading of 183,814 units at $9.25. Grace Kennedy added 44 cents to end at $59.99, with 3,986 stock units changing hands, Jamaica Broilers finished with a loss of 79 cents in closing high of at $30, with 10,979 shares changing hands, Jamaica Producers dropped $1.50 to close at $22, trading 1,000 shares. JMMB Group added 68 cents to end at $30.80, with an exchange of 8,172 shares, NCB Financial rose 99 cents to settle at $145, trading 28,332 units, Mayberry Jamaican Equities lost 35 cents in trading 10,508 shares, at $9.10. PanJam Investment jumped $1.70 trading 5,746 to close at $81.70, Sagicor Group gained 40 cents in trading 7,193 shares at $39, Seprod rose 60 cents to close at $42.75, with 22,923 shares traded and Supreme Ventures rose 27 cents and finished at $27, with 9,888 units changing hands. Trading in the US dollar market ended with 9,772 units valued at US$1,232. Proven Investments ended trading with 1,312 units at 22 US cents and Sygnus Credit Investments gained 1 cent in trading 8,460 units to close at 11 US cents. The JSE USD Equities Index advanced by 3.08 points to close at 180.23. Wigton IPO propectus is out. 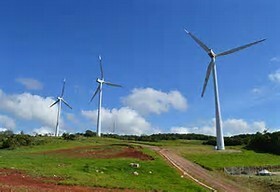 Investors greeted the release of the Wigton Windfarm IPO by pushing down the main market indices of the Jamaica Stock Exchange quite sharply, when activity ended on Tuesday, with reduced value of stocks trading. 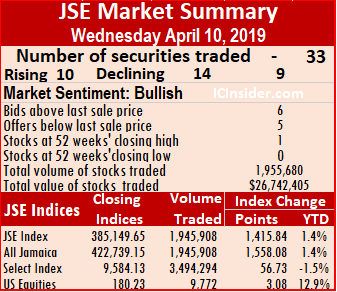 At the close, JSE All Jamaican Composite Index dropped 3,477.22 points to 421,181.07 and the JSE Index suffered a big fall of 3,159.78 points to 383,733.81. At the close of the main and US markets, 33 securities traded, compared to 29 on Monday leading to 10 advancing, 14 declining and 9 closing unchanged. Trading ended with 2,405,214 units valued at $42,509,143 compared to 2,044,315 units valued at $94,776,769 crossing the exchange on Monday. Supreme Ventures led trading with 506,307 units comprising 21 percent of total main market volume, followed by JMMB Group with 500,000 shares or 21 percent of the day’s trades and Carreras with 426,886 units and 18 percent of the volume traded. Market activity ended with an average of 77,588 units valued at $1,371,263, in contrast to 75,715 shares valued at $3,510,251 on Monday. The average volume and value for the month to date amounts to 198,040 shares at $2,749,721 for each security, compared to 216,255 shares at $2,996,728 previously. Trading for March resulted in an average of 438,501 shares at $9,851,307, for each security traded. In main market activity, Barita Investments climbed $2 to $46.50, with 586 shares changing hands, Berger Paints slid $1.20 to end at $19, with 7,834 stock units changing hands, Caribbean Cement finished $1 higher to an all-time closing high of $66, with 55,901 shares changing hands, Carreras dropped 70 cents and concluded trading of 426,886 units at $8.50. Jamaica Producers gained 40 cents to close at $23.50, trading 10,700 shares. 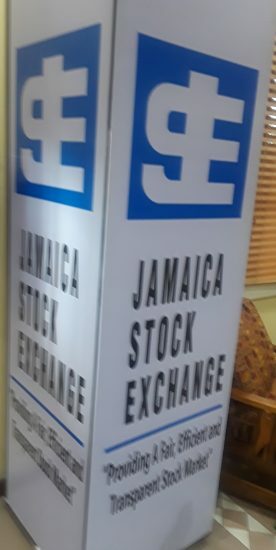 Jamaica Stock Exchange added $1 to end at $17, with an exchange of 6,690 shares, Kingston Wharves gave up $1 to settle at $70, trading 1,986 units, Mayberry Investments gained 50 cents in trading 33,501 shares, at $9. Sagicor Real Estate Fund lost 37 cents in trading 32,500 shares at $10.03, Seprod lost 52 cents to close at $42.15, with 18,647 shares traded, Stanley Motta gained 50 cents and ended at $5, in trading 3,000 shares and Supreme Ventures rose 73 cents and finished at $26.73, with 506,307 units changing hands. Trading in the US dollar market ended with 12,295units valued at US$2,616. Proven Investments lost 1 cent and ended trading with 11,140 units at 22 US cents and Sygnus Credit Investments traded 1,155 units at 10 US cents. The JSE USD Equities Index advanced by 0.98 points to close at 177.15. 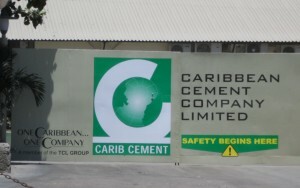 Caribbean Cement closed trading at a new closing high of $65. 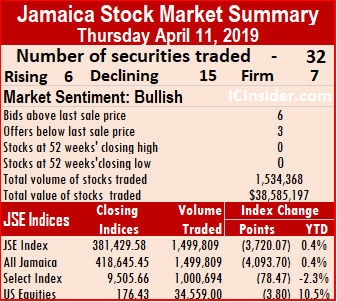 Trading on the main market of the Jamaica Stock Exchange ended on Monday with JSE All Jamaican Composite Index rising just 86.04 points to 424,658.29 and the JSE Index advancing by 78.19 points to 386,893.59. At the close of the main and US markets, 29 securities traded, compared to 30 on Friday and leading to 7 advancing, 15 declining and 7 closing unchanged. Trading ended with 2,044,315 units valued at $94,776,769 compared to 1,601,348 units valued $55,418,482 crossing the exchange on Friday. 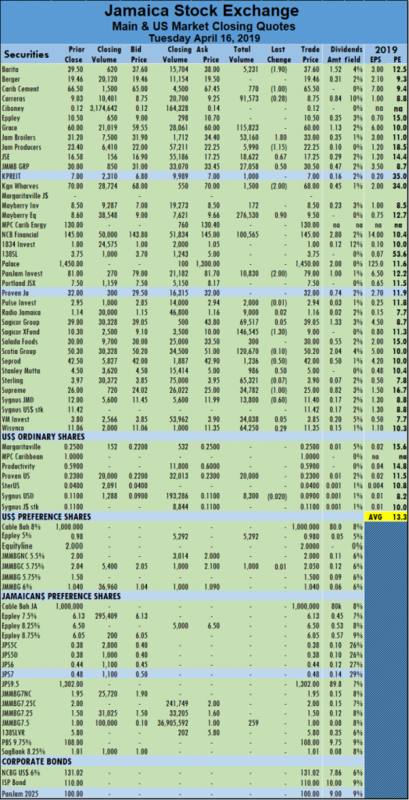 PanJam Investment led trading with 700,915 shares, comprising 34 percent of total main market volume, followed by Wisynco Group with 263,807 units or 13 percent and Jamaica Stock Exchange with 201,572 stock units and 10 percent of the day’s trades. Market activity ended with an average of 75,715 units valued at $3,510,251, in contrast to 59,309 shares valued at $2,052,536 on Friday. The average volume and value for the month to date amounts to 216,255 shares at $2,996,728 for each security, compared to 289,643 shares at $3,590,315 previously. Trading for March resulted in an average of 438,501 shares at $9,851,307, for each security traded. IC bid-offer Indicator|The Investor’s Choice bid-offer indicator ended with the reading showing 9 stocks ending with bids higher than their last selling prices and 4 closing with lower offers. In main market activity, Berger Paints slid 30 cents to end at $20.20, with 352 stock units changing hands, Caribbean Cement finished $4.37 higher at a all-time closing high of $65, with 110,457 shares changing hands, Jamaica Broilers lost $1.20 and finished trading of 22,956 units at $30.80, Jamaica Producers rose 50 cents to close at $23.10, trading 14,286 shares. 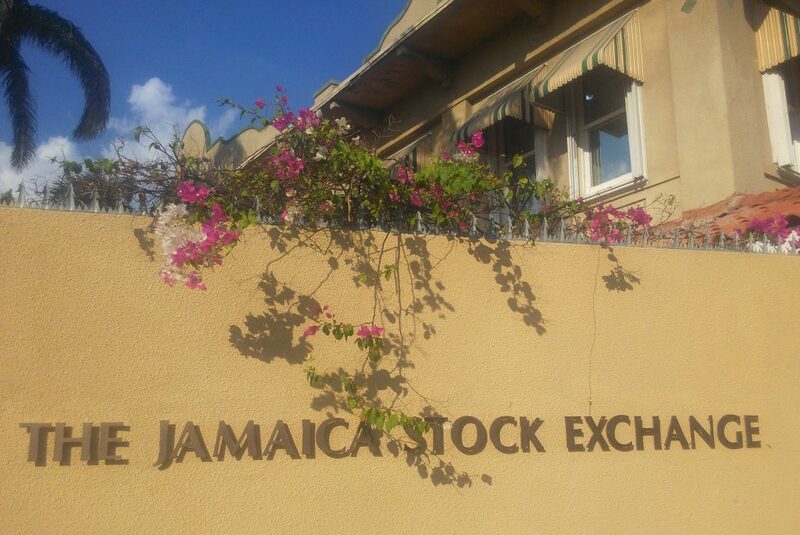 JMMB Group concluded trading of 74,318 shares with a fall of $1 at $30, Jamaica Stock Exchange lost $1 to end at $16, with an exchange of 201,572 shares, Kingston Wharves gave up $1 to settle at $71, trading 52,015 units, Mayberry Investments gained 50 cents in trading 28,000 shares, at $8.50. NCB Financial Group traded 19,678 shares in losing 49 cents to close at $144.01, Sagicor Group gained 69 cents, ending trading with 39,457 stock units at $38.74, Scotia Group dropped $1.60 trading 7,455 shares at $50.40 and Supreme Ventures lost 75 cents, finishing at $26, with 19,644 units changing hands. Trading in the US dollar market ended with 3,060 units valued at US$1,497. JMMB Group 6% preference share traded 1,000 units to close at US$1.04 and Proven Investments ended with 2,060 units trading at 23 US cents. 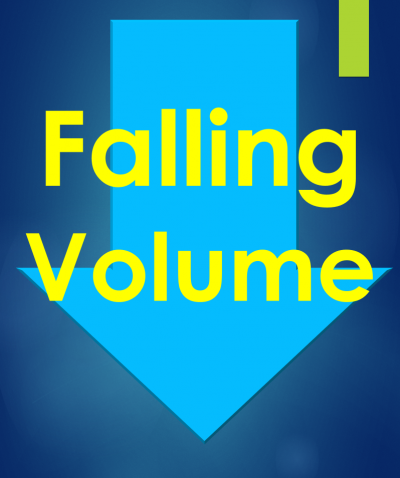 The JSE USD Equities Index declined 3.06 points to close at 176.17. 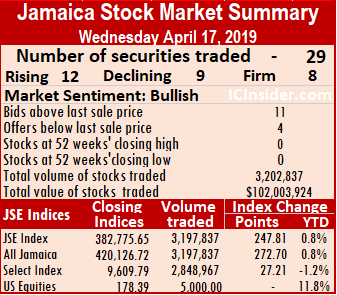 Trading on the main market of the Jamaica Stock Exchange ended on Friday with JSE All Jamaican Composite Index climbing 1,739.73 points to 424,572.25 and the JSE Index advancing by 1,580.91 points to 386,815.40. At the close of the main and US markets, 30 securities traded, compared to 33 on Thursday and leading to 14 advancing, 6 declining and 10 closing unchanged. Trading ended with 1,601,348 units valued $55,418,482 crossing the exchange, compared to 12,017,340 units valued $109,444,077 changing hands on Thursday. Scotia Group led trading with 508,817 shares, comprising 31.8 percent of total main market volume, followed by Carreras with 268,294 stock units or 16.75 percent of the day’s trades and Wisynco Group with 240,423 units or 15 percent. Market activity ended with an average of 59,309 units valued at over $2,052,536, in contrast to 375,542 shares valued at $3,420,127 on Thursday. The average volume and value for the month to date amounts to 289,643 shares at $3,590,315 for each security, compared to 341,904 units valued at $3,094,443 previously. Trading for March resulted in an average of 438,501 shares at $9,851,307, for each security traded. In main market activity, Berger Paints gained 40 cents and ended at $20.50, with 14,695 stock units changing hands, Carreras concluded trading with 268,294 units but lost 44 cents to close at $9.05, Jamaica Stock Exchange gained $1 to end at $17, with an exchange of 15,664 shares. Kingston Wharves recovered the $4 it lost on Thursday, to settle at $72, trading 2,700 units, Mayberry Investments fell $1 in trading 5,000 shares, at $8, Mayberry Jamaican Equities loaded 62 cents and ended trading of 9,296 shares at $9.70, NCB Financial Group traded 36,941 shares, losing 50 cents to close at $144.50. Scotia Group climbed $1.80 trading 508,817 shares at $52, Stanley Motta lost 81 cents to end at $4.50, trading 9,000 shares and Wisynco Group rose 54 cents, ending trading of 240,423 shares at $11.95. Trading in the US dollar market ended with 741,956 units valued at over US$96,943. JMMB Group 5.75% preference share traded 1,000 units with a 4 US cents gain to close at US$2.04Proven Investments ended with 160,056 units trading at 23 US cents and Sygnus Credit Investments traded 580,900 units to end at 10 US cents. The JSE USD Equities Index declined 0.15 points to close at 179.23.